Sunday Funday is from Essie's Summer 2013 collection and I recently purchased it at Walgreens. It's a pretty coral with a gorgeous shimmer that looks almost flakie like. I found the formula to be somewhat streaky, and although I've seen several blogger say they just needed two coats, I needed 3 to get good coverage. I think this would make a gorgeous pedi color too. Looks great on you! I can't wait to receive mine in the mail - and I'm going to test-drive it as a pedi color too. 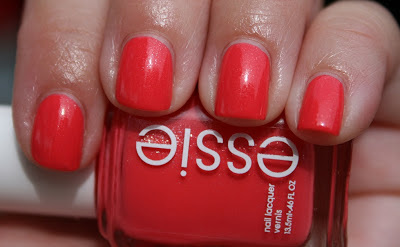 Somehow I gravitate towards Essie corals for pedis.